Soon our show website / blog will be moving to a new location. We are so very excited to bring to you features that have been requested by our listeners! The new place features forums to discuss show episodes, blogs from our listeners, and much more. 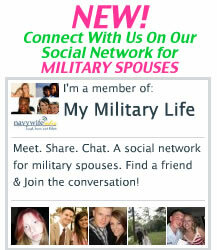 We are expanding the platform from Navy life to Military life and we can’t wait for you to join us. The new place will have a section for you to browse through previous episodes, a place to suggest your ideas and as always a place to ask your questions! LIVE and in person with Pat Hrabe, creator of Hey, Shipwreck! Do you Twitter?